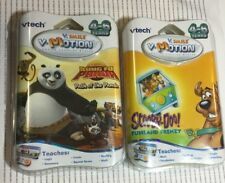 All New in Original Packaging: Lot of 3 VTech V.Smile Smartridge Active Learning System Games: * Disney Fairies - Tinker Bell * Scooby-Doo! - Funland Frenzy * Kung Fu Panda - Path of the Panda Please feel free to contact me if you have any questions. Thank you. Kung Fu Panda (DreamWorks, 2008). All in like new condition. 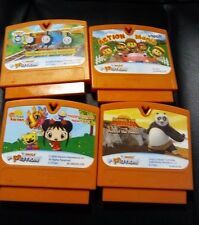 Action Mania (VTech). Dora's Fix-It Adventure (Viacom, 2008). Kung Fu Panda. T H A N K Y O U.
Scooby-doo Funland Frenzy. Kung Fu Panda Path of the Panda. Shrek (Ever After). Kung Fu Panda (Path of the Panda). Walt Disney Tinkerbell. Action mania. These item are conditions of decent to Very rough (I will best of my knowledge explain in detail). Disney PIXAR WALL•E & KUNG-FU PANDA: Path of the Panda. FREE Trial! 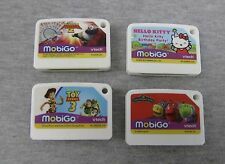 For Ages 3 to 6. Kung Fu Panda: Path of the Panda. Thomas and Friends: Engines Working Together. Action Mania. Entertain kids with Chuggington - V. Reader Software. Children can listen to the story as it's read to them or touch words one by one to hear them read aloud. Brewster tries to teach them how to use the turntable, but they run and hide while his back is turned.